You would think Honda might learn from talking up expectations too soon into a new partnership, but they have quickly revealed their goals with the Toro Rosso team just one day after the deal was announced. The power unit supplier want to push Toro Rosso to at least third in the championship next season, despite finishing no higher than sixth with McLaren, and Toro Rosso finishing no higher than sixth... ever. 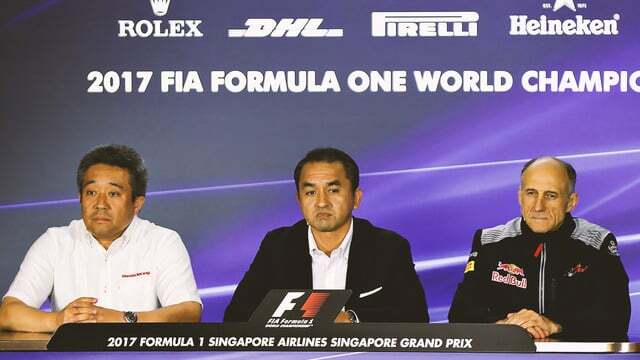 Honda's communications director said: "F1 is a very important culture and DNA of our company. It is true that we have gone through a tough situation... but quitting F1 was never an option for us. It's our goal to overcome this tough challenge. Honda's spirit is to come back and next year our goal is to fight for the top three at the top of the grid." Honda's motorsport chief Masashi Yamamoto has admitted that McLaren have been looking to exit the partnership since the start of the season and they were disappointed it hadn't worked out, but: "The spirit of STR is the same as the spirit of Honda, and I believe we can work smoothly for next year."